Bacterial conjugation is the transfer of genetic material between two bacterial cell via direct cell-to-cell contact. 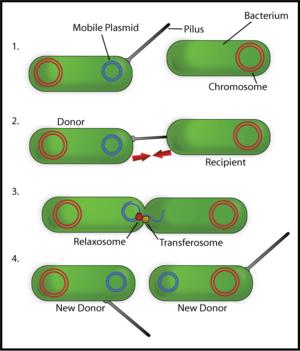 Although often incorrectly characterized as the bacterial equivalent of mating, in fact it is simply the transfer of genetic material from a donor cell to a recipient cell. Bacterial conjugation is also known as a "type IV secretion system". OriT (Origin of Transfer): Unlike other plasmids, the conjugative plasmid has its own origin of transfer nic region. This is a specialized portion of the genome where one of the two strands of the circular plasmid DNA is cut to allow for rolling circle replication of the plasmid containing the OriT region into a recipient cell. During rolling circle replication, the cut end of one strand is inserted into the recipient cell while recipient polymerases construct the complementary strand back into a circular piece of DNA. Two of the most well-studied and characterized types of conjugative plasmids are types "F" (from the F plasmid) and "R". The employed nomenclature for conjugative plasmid genes is the gene name first with the type afterwards. For example, the "TraJr" or "TraJR" gene denotes the "TraJ" gene of the "R" type conjugative plasmid. Note it was previously believed that transfer of genetic material occurred via the pilus itself; now, most think that the transfer of genetic material occurs via a separate direct channel between the two cells. Yifan Yang, Mingzhi Qu and the 2007 Peking Yniveristy iGEM team designed the parts BBa_I714000, BBa_I714003, BBa_I714030, BBa_I714031 and BBa_I714032. The 2005 Berkeley iGEM team designed the parts BBa_J01000-BBa_J01003 and BBa_J01077-BBa_J01078. Chris Anderson and the 2006 Berkeley iGEM team design the parts BBa_J23046. Ingrid Swanson and the 2008 University of Washington iGEM team designed the parts BBa_K109550 and BBa_K109551. Margaret Ruzicki and the 2008 University of Hawaii iGEM team designed the parts Part:BBa_K125320, Part:BBa_K125350, and Part:BBa_K125360.